'Extreme Design' (Glenn Bowers, R. 1998). Seedling A8-9. TB, 33" (84 cm), Midseason late bloom. 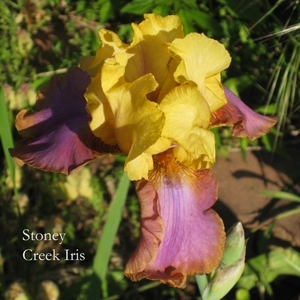 Standards light yellow (Pantone 3935U); style arms light yellow, lavender midrib; Falls light violet (2635C), diffuse buffered gold (110U) edge; beards yellow, light violet at end; ruffled; slight sweet fragrance. 'Cranberry Tea' X 'Heavenly Body'.